My name is Lily Jensen and I am so grateful you have arrived here! Welcome to My Money Healing, your sanctuary for creating more money, wealth and abundance in your life. I’m passionate about helping you create a life of abundance. As a Money Reiki Master, I’ll help you erase the blocks, limitations and negative energies that have kept you from experiencing the money and other forms of abundance you’d like to enjoy. Are you well-educated and well-prepared, but still seem to always be in a financial crisis? Are you tired of living from paycheck to paycheck and struggling to create enough money? Or do you make enough money but it always seems to slip through your fingers? Do you believe that making or keeping money is hard? Do you feel guilty about having more than others? Do feel stressed about how you are going to provide for yourself and your family? My Money Reiki Healing Sessions align you with a higher energetic vibration, allowing money, wealth and abundance to start flowing to you with more ease. Each session heals the negative energies that you have collected and believe about money and your self-worth. My Money Reiki Healing Sessions powerfully heal the deep and sometimes hidden issues that keep you from living a life of true abundance. A life you deserve! Having Abundance Is Your Birthright! Many of us have conflicting beliefs and energy around money, prosperity and abundance. We aspire to live well and to provide for our families, our employees, our animals and our communities. However, society and perhaps our own family have fostered beliefs that money is bad or that we are not worthy of having plenty. I can relate. For years, I had more than my share of money distresses. I am hard-working. I’m a positive person and I don’t blame others for my troubles. But for years, I didn’t understand why I wasn’t making (and keeping) the money I desired since I was working so hard. Also, I’m a huge believer in the power of affirmations and the Law of Attraction. But what I learned that completely changed things for me is that it’s really important to clear out the layers of negative energy around money that not only surrounds, but literally embodies us. It is only then that the Law of Attraction has the best opportunity to work for us. Once I was able to clear my blocks and truly align with the vibration of the Spiritual (Pure) Energy of Money, money flowed right to me and I didn’t have to work so hard anymore. The truth is that you are worthy and deserve abundance in all areas of your life! Our Universe is unlimited and always expanding. As such, there is always more than enough in the Universe to provide for all. My Money Reiki Healing Sessions actually work to lift the negative energies not only for yourself, but for all others, creating harmony and abundance in the Universe. 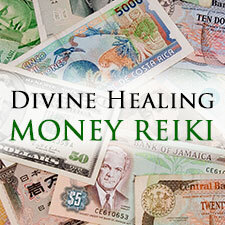 Money Reiki Healing makes perfect sense as you reflect on some of the beliefs that your parents, grandparents, family and ancestors have had about money. Although intellectually you probably disagree with some of those beliefs (“What do you think…money grows on trees?” “Making money is hard!”), the generations of negative energy are layered on you, sometimes without your knowledge or consent, and have a huge effect on your energy. The more dis-harmonizing those beliefs, the more conflict you will have with money and the harder it will be to attract money and wealth to you. What I’ve described so far is just one aspect of how we become separated from how we are meant to live in abundance, with great prosperity and joy. It’s possible that your family had great money values, but perhaps your money beliefs, blocks and limitations came another way. Regardless of how you may have inherited your poverty or scarcity beliefs, you can now heal the blocks that keep you from having more money and true abundance. Schedule your Money Reiki Healing Session NOW and begin to experience the flow of more money and abundance. "After I did money energy healings with you, I received an unexpected promotion at work out of the blue! And best of all, the promotion came with a substantial raise. I can't wait until my next money healing!" - Susan B.